It can sometimes be difficult to remember which astrological signs are compatible with one another, so we decided to create an easy to understand chart that you can use as a reference guide. While we tend to have a focus on love and relationships here at Zodiac Love Match, it’s important to remember that compatibility can extend beyond just personal relationships and can also include friendships and business partnerships as well. It can also be entertaining to think about how different signs work together and apply it to everyone you meet or know. While any two signs can make it work together if determined to do so, there are some signs who will find it much easier to achieve than others. Getting a full understanding of the characteristics and personality traits of your sign, and of the signs of others you know, will help you learn exactly what to do to get along in perfect harmony. 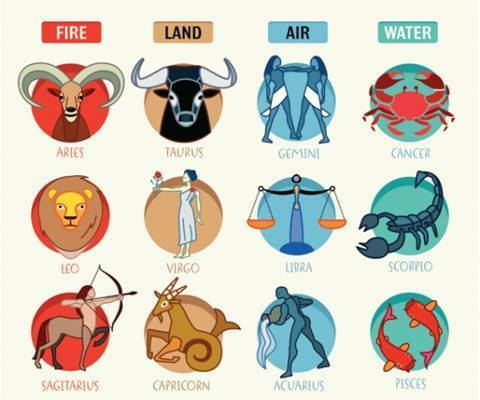 The easiest way to remember which signs go well together is to remember that all zodiac signs are associated with an element. Like elements go together well. So, for example, Cancer and Scorpio are both water signs, and so they can usually get along perfectly with one another. On the other hand, fire, which is the opposite of water, does not always go so well with water signs. It would not be a good idea to combine fire and water, so Scorpios should stay away from signs like Aries or be prepared for a lot of effort ahead of them to make it a lasting and fun relationship. Here is the chart below for you to use as a handy reference guide on which signs get along with each other the best and make for the best possible zodiac matches. As you can see, all like elements go together with one another. Pisces, Scorpio, and Cancer are water signs; Aries, Sagittarius, and Leo are fire signs; Aquarius, Libra, and Gemini are air signs; and Taurus, Virgo, and Capricorn are earth signs. 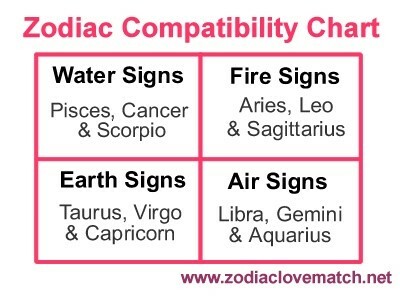 The elements opposite of each other are traditionally opposites in relationships, so Water signs do not do well with Fire signs, and Earth Signs do not do well with Air signs. Water and Earth can make for good matches however, as can fire and air. Fire and Earth are possible, but not always the best, and the same goes for Air and Water. So now you have an easy way to remember compatibility easily! To print the astrological compatibility chart easily, simply right click on one of the charts above to save and print it for your own use later. You can then cut it out and tape it somewhere to remind you every day of the compatible signs if you wish!